Waterproof fabrics are fabrics that are inherently, or have been treated to become, resistant to penetration by water and wetting. The term "waterproof" refers to conformance to a governing specification and specific conditions of a laboratory test method. They are usually natural or synthetic fabrics that are laminated to or coated with a waterproofing material such as rubber, polyvinyl chloride (PVC), polyurethane (PU), silicone elastomer, fluoropolymers, and wax. Treatment could be either of the fabric during manufacture or of completed products after manufacture, for instance by a waterproofing spray. Examples include the rubberised fabric used in Mackintosh jackets, sauna suits and inflatable boats. The most common waterproofing treatment in the early 2000s was the application of C8 fluorocarbon-based textile finishes during manufacture. However, environmental and health concerns led to a transition to C6 fluorocarbon-based finishes and the development of alternative chemistries, such as ChemStik technology, a solvent-free process involving the on-surface polymerization of hydrocarbon chains. Waterproof/breathable fabrics resist liquid water passing through, but allow water vapour to pass through. Their ability to block out rain and snow while allowing vapour from sweat to evaporate leads to their use in rainwear, waterproof outdoor sports clothing, tents, and other applications. Standard laboratory testing protocols[which?] define the performance of these fabrics. Water resistance is measured by the amount of water, in mm, which can be suspended above the fabric before water seeps through. Breathability or Moisture vapor transmission rate is measured by the rate at which water vapor passes through, in grams of water vapour per square meter of fabric per 24-hour period (g/m2/d), often abbreviated to just "g". In recent years[timeframe?] some,[who?] but not all, sporting goods manufacturers have begun including this information on their product labels. Typical mid-range fabrics tend to have values of 5,000 mm of water resistance and 5,000 g of breathability; the best materials have 20,000 mm and 20,000 g.
One specific definition of "waterproof/breathable" requires the fabric to withstand a pressure of over 1,000 millimetres of water (9.8 kPa) pressure without leaking (see hydrostatic head). Fabric construction which directs water away from the body, rather than membranes, coatings or laminates, can be used to keep the wearer dry. This means that perspiration can be moved away from the body more effectively, as both liquid water and water vapour can be directed. 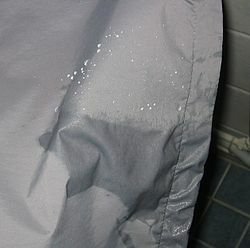 These are directional fabrics such as Nikwax Analogy and FurTech, which are also breathable in the conventional sense (although these examples are actually a combination of two different fabrics, a directional "pump" layer underneath a distinct windproof and water resistant outer layer, and while effectively completely waterproof against rain they would fail a strict hydrostatic head test as given in the definition above). Garments that combine waterproofing with some thermal insulation, such as those manufactured by FurTech and Nikwax Analogy, resist cold bridging, heat transferred through layers of poorly-thermally-insulating materials in close contact that would be prevented by a small airspace. When there is cold bridging, vapour on the dry side can condense on the cold surface, making it appear that the thin waterproof breathable fabric has leaked. ^ Staff (October 2014). "Permanent Water-Repellancy". R&D Magazine (Paper). 56 (5): 14. Retrieved 3 June 2016. ^ "Water Vapour Transmission Rate Measurements". National Physical Laboratory. 1 June 2011. Retrieved 23 May 2017. Wikimedia Commons has media related to Waterproof clothing. This page was last edited on 13 January 2019, at 22:04 (UTC).